Ok, that headline is a little misleading. I got a spacer from Vech (who is one of our spnsors! Thanks Vech!) for the new roller bearings for the steering head and spent an hour modifying the piece — which is intended to work on the US fork /2 models — to work on the R52, and was able to remount the front forks. So, I am working on the bike... some. But what I'm really focusing on right now is whipping the Sprinter van into shape. I bought it in January last year as a vintage bike hauler. I've seen them in use in Europe, fitted out with fold down beds and small kitchens and awnings, with room to haul a couple bikes, so I had been on the hunt for a while when I found a slightly used 2004 model (only 115,000 miles!) at a good price on Craigslist. It was in Sacramento, and on my way home, I stopped at a Cycle Gear shop that was right along I-80 and bought a couple of the rocker-style wheel chocks. Since then, I have done nothing else to the van, other than add a backup camera. The chocks are still floating loose in the back! Obviously, this has to change a bit. The first thing is that the floor has to be dealt with. The PO had put down some masonite, but there is a strip on the right side where he had installed shelves or a machine, and there's no masonite. Last week teammate Steve Woodward was here for a few days and we cut a piece of plywood to fit the hole. Yesterday I got a remnant piece of heavy duty, waterproof vinyl flooring for cheap, and I hope to get it installed in the next few days. I've never installed flooring before, so this will certainly be an adventure. The van has a bulkhead between the cab and the rear, and I bought a couple of big U bolts. I'm going to drill the bulkhead and put the bolts through it, so that they can lock the upright posts of the wheel chocks. This will make it easy to remove the chocks at any time and not leave anything protruding out the floor or back from the bulkhead. 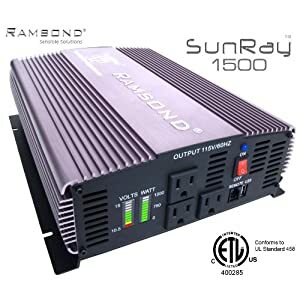 And I've ordered a big true sine wave inverter. Installing it will require removing the driver's seat in the van to get a 4 gauge wire in from the battery. I plan to mount the inverter on the cab side of the bulkhead wall, and then run two power strips through the bulkhead to cargo area. That will leave one outlet and the USB charger port available in the cab and make it easy to see the battery charge level and watt meter displays. The inverter is needed to run flourescent lights in the cargo area, which is otherwise a black hole. I bought a couple of battery powered LED lights, but they're really not bright enough. Also, the inverter has to run a small contractor's pancake air compressor. Finally, I'm building a fold down work table. It will have a metal top but otherwise is constructed from 2x4 framing and a plywood cover. It will have two fold-out legs to support the front. I intend to bring a vise that will mount to it. Not actually important for the functional use of the van — but very important for the team — are the magnetic signs I have to order this week. They will display the logos of our big sponsors, and list the names of our individual sponsors. If you want to put your name or the name and logo of your business on the side of the Team Boxer Rebellion van, as it travels from California to New York and back, your time is running out! Lonnie Isam, the organizer, has been putting up information about the route on the Cannonball website. He has the first five days' route laid out so far, and it's worth reading if you want to understand where we're going and the challenges we're going to meet. We still won't know the actual route we're riding until each morning. A number of people have asked me where we will be riding on a particular date, but other than taking a SWAG, I just don't know. OTOH, if you can be at the start or one of the events we will be attending, you are absolutely welcome to ride along. I think we will all enjoy the support! We will be at the Doubletree downtown in Milwaukee. In [A]namosa, [IA,] we are at the Americinn and the Super 8, and in Spirit Lake, [IA,] the Inn at Okiboji, which is right on the lake. The first night in Wellsboro, PA, will apparently be at the Penn Well Hotel. We will also be attending events before the start (September 6) at the Motorcyclepedia Museum in Newburgh, NY. On September 10, we'll be at the Harley Davidson Museum in Milwaukee, and the following day at the National Motorcycle Museum in Anamosa, IA. We don't know yet where the grand finish in San Francisco will be. As I learn more about the specific dates and events I will update the blog. In other news, two time Cannonballer Buzz Kanter has a partially torn achilles tendon, which will keep him in a cast right up until the start of the Cannonball. And the youngest entrant, aged 19, Jesse Spellicy (#64), who was intending to ride a 1924 Henderson Special, will not be able to make it after he was badly banged up in an accident with a left turning car. Spellicy is part of a team from SUNY Canton's Powersports program that has spent the last year working on their Henderson as a class project. Of course, I wish the best to both, and am particularly saddened about Jesse. I also received some very nice photos from #62 Joe Gimpel (riding a 1929 R62) and saying that the bike is close to ready. Submitted by Marc St-Pierre (not verified) on Mon, 07/23/2012 - 12:59. Darryl; Susan and I booked our rooms in Newburgh & Wellsboro a couple of weeks ago. It turns out that we're booked in the same hotel that the Rally is meeting at; the Penn Well Hotel. We'll definitely be there to cheer you and the other BMW riders at your arrival. Submitted by Darryl.Richman on Tue, 07/24/2012 - 08:55. It will be great to have you both ride along! As I mentioned, although I don't know what each day's specifc route will be, we are encouraging people to meet us where they can, and are welcome to ride with us. Last night I slept in my own bed, after being up for about 27 hours straight. I could rant on about how awful air travel has become, but I'll spare you that. I would advise you to avoid JFK if possible, however. And I note that BMW's longtime seat engineer must have a new job working for Delta. Hopefully this is good news for future BMW models. Alas, my magneto didn't catch up with me in Germany. The renowned Deutsches Post decided that it should relax for three days in Mannheim on its way to me in Karlsruhe, in spite of the Express shipment surtax. So now it will spend probably weeks getting to me through both the Deutsches Post and the USPS. I also have a spare set of pistons coming. I spent a nice afternoon chatting with Axel Gännsle at his shop in Pasing, a suburb of Munich. I am also waiting for a new kickstart lever from Josef Heft. The last weekend before I flew out to Germany, I rode the R52 over to the vintage breakfast in Redwood City. I stopped for gas on my way out of Santa Cruz, and the kickstarter was there. But later I noticed that it was missing. I did some hunting but to no effect. Living without a kickstarter isn't life or death. The bike starts easily enough with a bump in 2nd gear, and when it's warm, I can actually start the bike in 2nd while just paddle walking it. There are some advantages to a 5:1 compression ratio engine! But it's annoying to have to do that to work on the engine. Kickstart levers are surprisingly hard to come by. None of my usual sources had one or really knew where to find one. I did spend a fabulous time at the home of Torston Tausch, who had about a dozen 20s and 30s BMWs — mostly the sport OHV models! — in various states of renovation and motors and gearboxes piled up like cordwood! He makes significant numbers of his own parts and then does small batches of them for the aftermarket. If you want a rennsport dual leading shoe front brake for your Stecktank model BMW, for example, Torsten has them, and they are beautiful. Unfortunately, Torsten doesn't have any kickstarters right now, either. He plans on making some up in a few weeks. But I kept looking because I didn't get an assurance of an availability date. Fortunately, Fred Jakobs, chief archivist at BMW, did some hunting around for me. He talked with Sebastian Gutsch, who has worked in the archives also and is deeply into building an RS255 Königswelle Rennsport machine and vintage racing, made the connection to Josef Heft. I hope to have it in a couple weeks. I hope to tear into the forks this week. I acquired a replacement roller bearing set for the steering head, to replace the existing loose ball bearings I expect to find in there. I also want to inspect the bushings in the trailing link suspension and replace them if needed. This is the last area of the bike that I haven't been through. Submitted by Andy Kaindl (not verified) on Tue, 07/24/2012 - 13:50. Submitted by Darryl.Richman on Tue, 07/24/2012 - 19:32. Hi Andy! Best of luck with your Henderson 4! And thanks again for those tasty Wurstls! The kickstarter problem should be fixed within a couple weeks. Josef Heft has one ready for me, and the money has been Paypaled to my friend in Germany, who has made an Überweisung to Heft. Submitted by peter `powerplus` (not verified) on Tue, 11/08/2016 - 18:54.
hi Darryl , have any contact to Josef Heft from Germany ? Bitte! Ich suche Teilen für Oldtimer BMW Motorrad! I am still in Germany. I've made a couple visits already, as you know from my last post. Yesterday I was in the Allgäu, which is a lovely area of rolling dales that runs from the Austrian border and Mad King Ludwig's famous Neuschwanstein dream castle in the south, north to Ulm. It is Germany's breadbasket, with lots of agriculture and little development. The A7 autobahn, which runs down the western edge, was only just finished a few years ago. On the eastern side of the Allgäu is the small town of Krumbach; and a tiny hamlet north of Krumbach is Oberegg, where Dreher Oldtimerteile is located. Philipp Dreher is a BMW enthusiast whose main business is farm equipment, though he has in the last few years acquired laser cutting equipment and now makes a variety of sheet metal products. When Joseph Kast retired from selling vintage BMW parts, Philipp bought his business, and now prewar BMW parts fill the shelves in the last few rows of his warehouse. My big scores were a spare clutch plate, a set of roller bearings for the steering head (to replace the loose ball bearings that are surely still inside my steering head), a complete set of spare gaskets and some carburetor jets. These parts were generously donated to Team Boxer Rebellion in exchange for space on the side of my Sprinter van as TBR travels to the east coast and back again to San Francisco. Vist my website to see the growing list of donors to Team Boxer Rebellion, and to see how you can participate! You'll see that several well known and regarded vendors and service providers are helping me, and I urge you to support them as well. I had word back from Uli Döderlein of Bayrische Magnet Zünder about the spare Bosch D2A magneto I left with him. Sadly, just about everything I didn't replace before needs replacing. These are, naturally enough, the most expensive pieces: a new generator armature, a new magneto coil, a new cam ring and a new condenser, not to mention a handful of specialty screws and other bits and pieces. This will not be cheap, but I have total faith in Uli's ability. Submitted by andres / grabacion (not verified) on Thu, 06/21/2012 - 18:22. Submitted by Jim Hansen (not verified) on Sun, 06/24/2012 - 12:22. "...lovely area of rolling dales..."
It's a tough life, but someone's gotta do it. Submitted by castors (not verified) on Mon, 06/25/2012 - 06:55. Not that the bike market isn't zooming along itself. Ron Christensen, of Mid-America Auctions, whose Las Vegas sale every January moves 400 to 500 bikes in a single weekend, reports that sales have nearly doubled since 2000. Submitted by Marc St-Pierre (not verified) on Wed, 07/04/2012 - 14:34. Darryl; just to back-track a bit; how did you end up repairing the final drive? Was there any modification to the original design, like a spot weld to hold it in place, or even a machined keyway and key? Submitted by Jim Hansen (not verified) on Mon, 07/09/2012 - 14:31. Submitted by Darryl.Richman on Wed, 07/18/2012 - 14:46. BMW has long relied on these in a number of critical places. Some joints in the drivetrain are made with tapers, such as the flywheel to the crankshaft and the output flange to the end of the output shaft in the transmission. But the crankshaft is pressed together with just interference fits between each web and the crank pins; there are four of these fits. The cardan brake drum is press fit to the drive shaft. In the final drive, on a stock solo machine, the pinion is pressed onto the drive shaft, and the ring gear carrier is pressed onto the short shaft that drives the rear wheel. It drives the wheel with a hub that is pressed on, and into which four dogs are pressed. Clearly BMW felt that an interference fit was entirely sufficient, not only for the 12 hp of an R52, but the 24 hp of an R63. Because this bike is 85 years old, I suspect that the fits may not be as tight as they once were, since they have probably all been pressed apart and back together more than once. I am in Germany collecting parts and getting work done for the R52. In particular, I rode through Bavaria today and stopped in at a shop in the tiny hamlet of Orthofen, where Uli Döderlein performs his black magic on magnetos. I have a spare Bosch D2A magneto/dynamo (generator) of the type needed for the R52, which was dead about 4 years ago, when I last visited Uli. I bought a bunch of likely parts then -- but clearly, not all of them -- and just in the last few months I tried to reassemble them into a working mag/dyno. I was half successful. The generator does seem to put out power, although I don't have a jig in which to spin the mag/dyno fast enough to see that all is working exactly as needed. But I couldn't raise a spark from the magneto side of things. That might be because I didn't buy a new mag coil. Or because I didn't buy a new condenser. Or because the permanent magnets are dead (but I think this last item is not likely because the generator also depends upon them). I am not the only one who relies on Uli. He mentioned that he was finishing up work on magnetos for two other Cannonball entrants: Chris Knoop (#16 and riding a 1925 JAP) of Australia and the only German entrant this time, Andreas Kaindl (#33 with a 1924 Henderson DeLuxe) of Bavaria. Turns out that Andi lives about 15 minutes away and Uli was fairly insistant that we go over and visit. The visit turned into a very pleasant couple of hours. Andi is a third generation metzger, which the Germans always translate as butcher, but seems to me to be closer to sausage maker. Andi is, at heart, an Indian fan, but more than that, he likes original condition bikes, not restorations. And the Henderson he found is very original. The previous weekend he had test ridden the Henderson over 800 miles on three consecutive days to prove its road worthiness. (He rode it to -- naturally -- an Indian rally in northern Germany.) Anyway, he had just received some bead locks for his clincher style wheels and so the bike partially disassembled again as he worked on that. So we had to stop looking at the Henderson and admire his Indians. A Chief here, a Four there; I am truly not appreciative enough of these beautiful bikes. He also showed me his BMW R52, which he had recently acquired along with a Sunbeam S-8. Eventually Uli realized he had some magnetos to attend to, so we made our excuses. I look forward to seeing Andi again in September, and also to seeing Uli's handy work on Chris Knoop's bike too! Need magneto work done? I highly recommend Uli Döderlein at Bayrische Magnet Zünder (BMZ). Find details at http://www.magnetos.de.